At Gallery Furniture, we don’t just push sleep for sales. 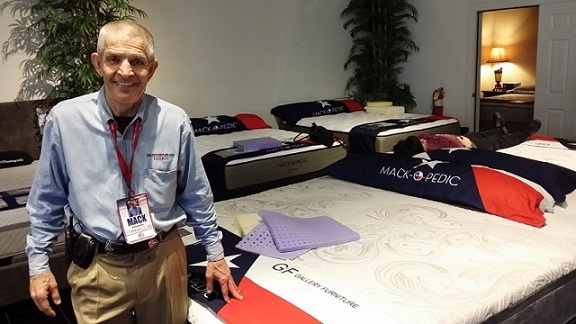 We implement what we preach into our own lives, including our very own Jim “Mattress Mack” McIngvale. Sleeping 7-9 hours a night is a goal of every member of the Gallery Furniture family as we share tips and our progress with one another daily. 1. Leave stress in the nightstand drawer before getting into bed! 2. Get your room as cold as you desire. 3. Your room should be pitch-black dark– a nightlight is okay if necessary. 4. Turn off–and leave off–all electronic gadgets, including cell phones and TVs. 5. No caffeine after 2:00 PM. 6. Great sheets make great sleep easier–take care of your sheets like grandma did! 7. Have a go-to-sleep ritual to prepare for great sleep–don’t just crash! 8. Go to sleep and get up at the same time as often as possible. 9. Sleep 7-9 hours every night—catching up on weekends doesn’t work! 10. Your mattress at home should be better than any hotel mattress you’ve ever experienced! Success doesn’t have to come at the price of sleep deprivation. The increased health risks simply aren’t worth the cost. 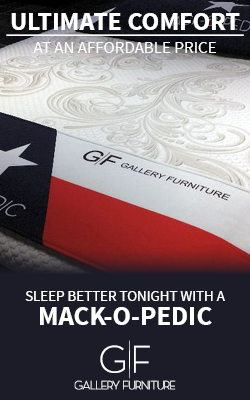 Come see our non-commissioned Gallery Furniture Sleep Experts at one of our 3 locations in the Houston area: 6006 North Freeway, 2411 Post Oak or 7227 West Grand Parkway South. If you haven’t been feeling like the best version of yourself, take Mack’s advice, the biggest thing you can do to improve your health is sleep better!